With technological advances, cooking and food preparation methods have advanced as well. 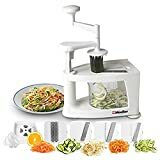 One of the new styles of food preparation includes a unique method of cutting or spiraling the vegetables with the help of a gadget called a spiralizer. Today, this invention has come a long way, with more innovative features and attributes. 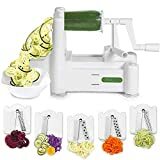 After going through spiralizer reviews on the Internet, we have compiled a guide for you to skim through before selecting the best spiralizer for your needs. 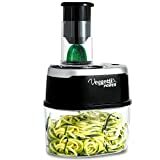 There are many types of spiralizers for cutting vegetables and fruits into tiny little spirals or strands. 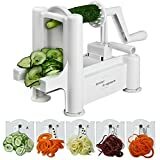 For the food lover in you, buying a spiralizer means a lot! 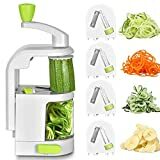 With that in mind, we have taken care to list the factors you must consider before buying this useful kitchen gadget. Check the type of blade: Look for a 420-grade blade made of stainless steel. Such a blade can cut through hard vegetables. 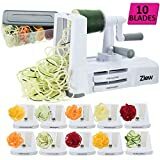 It makes for the strongest and best spiralizer. Opt for a smaller but efficient device: With a modular kitchen setup, it is not easy to stuff the kitchen with appliances that take too much space. Instead, buy a product that is smaller in size and fits in the drawer, but is still good at its task. 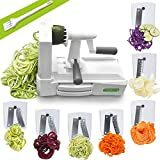 Select a take-apart design: Choose a spiralizer that can be taken apart into multiple pieces. This way, washing the gadget becomes easy. You should be able to reassemble the parts later with ease. 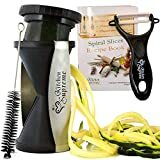 Look for three-blade spiralizer: Opt for a three-blade product—it gives you more options, such as being able to prepare spiral-shaped, spaghetti-shaped, and julienne-shaped vegetables and fruits, thus making your meal look appealing. Ensure safety: No one wants to go through the risk of a cut finger while preparing a meal. 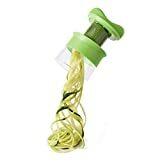 Look for a spiralizer that comes with a safety cap to protect your fingers.